Nigerian hairdresser, Vivian Effoussa described watching horrified as fellow passengers fell into the sea. "The boat we entered was leaking," said Effoussa, who attempted the crossing to Europe after struggling to support two children back home. "All of a sudden... the water was (coming) inside. Everybody started shouting," she said, speaking in English. "Gradually, gradually, we see ourselves inside the sea. Everybody, we're falling inside, dragging each other. They even pulled my hair, dragging me." "Really, I didn't think the sea was big like this," Effousa said, adding that, had she known, she would not have come. 85 migrants, including 18 women, were rescued with the help of fishermen who alerted the coastguard, said Issa al-Zarrouk, a coastguard official in Garabulli, 60km east of Tripoli, Libya. Navy spokesperson Ayoub Kacem said the boat sank six nautical miles northwest of Garabulli, and 10 fishing boats took part in the rescue. 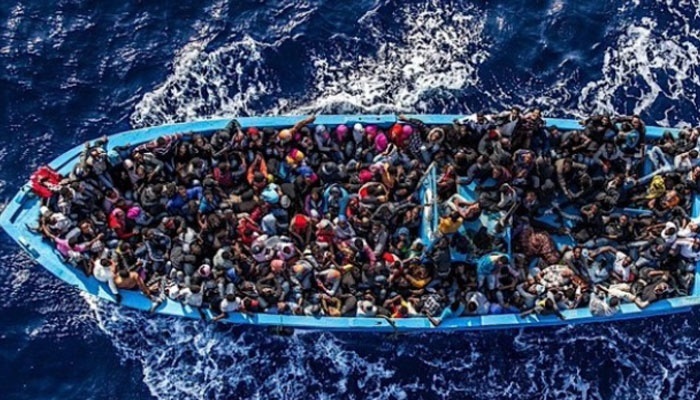 35 migrants, including seven children, were feared drowned. The rescued migrants were from countries including Nigeria, Senegal, Cameroon, the Ivory Coast and Ghana, Kacem said.